Mobile app VaxOnTime gives parents a vaccination reminder. Here's how to never be late for your child's vaccinations again. There comes a moment every few months, while I’m flicking through my calendar, that I realise I am, yet again, weeks late organising to have my children vaccinated. I silently apologise to the herd for once again compromising our collective immunity and pick the phone up to organise an appointment. There’s plenty of evidence around that suggests the two main reasons parents aren’t immunising their children are related to access issues or because they question the science of vaccination. That is, they either don’t believe vaccines work, or they have issues with the logistics, costs etc involved in getting their children immunised. I fall into neither of these camps. I’m simply less organised than I need to be. "If a million kids delay their vaccines by a month, that&apos;s time during which a disease could spread." Image via iStock. Worryingly, as Mother Jones reports, US epidemiologist, Jason Glanz says, "If a million kids delay their vaccines by a month, that&apos;s time during which a disease could spread." In the same piece, Mother Jones quotes Shannon Stokely from the Center for Disease Control, a US public health institute, "You have so many things to remember when you have a child and vaccines can slip your mind." An estimated 20 per cent of parents forget when their children are due to be vaccinated, but research shows that reminders have been shown to increase vaccination rates. 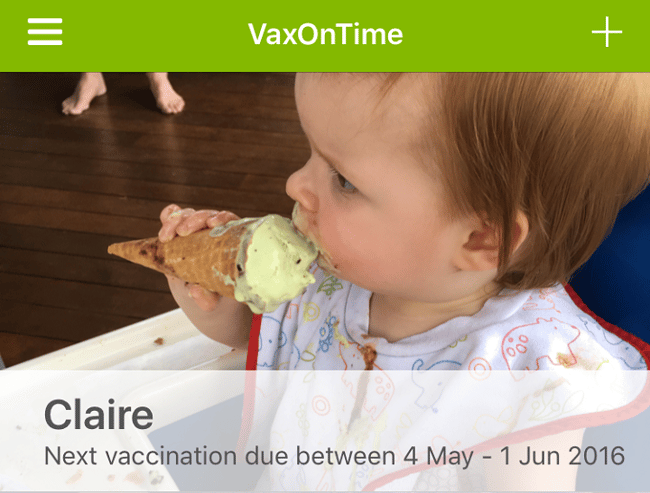 The Victorian Government have released a new mobile app, VaxOnTime, to remind parents when their children are due for immunisation, and my diary and I thank them profusely. Won&apos;t forget the baby&apos;s next vaccination now. In launching the app, Victorian Health Minister Jill Hennessey said, “Refusing to vaccinate your child not only endangers their health, but the health of every other child in our community. The launch of the app comes after an outbreak of chicken pox at a suburban Melbourne primary school has infected over a quarter of students. Additionally, starting on 1 January, Victorian children will no longer be eligible to attend childcare or kindergarten (three-year-old and four-year-old preschool) unless they have been fully immunised, under the &apos;No Jab, No Play&apos; laws passed by the Labor Government earlier this year. The New South Wales Government introduced similar legislation in 2014, and has already seen an increase in vaccination rates. &apos;No Jab, No Play is also due to roll out in Queensland shortly. New &apos;No Jab, No Play&apos; laws will require all children in preschool and childcare be fully immunised. Image via iStock. In April, the Federal Government announced that from the 1st of January 2016 there would be national &apos;No Jab No Pay&apos; laws. A parents who failed to immunise their children would no longer received the $200-a-week childcare benefit, the $7500-a-year childcare rebate or the $726 Family Tax Benefit A annual supplement. While the latest results from the Australian Childhood Immunisation Register shows that 93.2 per cent of five-year-olds in Victoria are fully immunised, coverage of 95 per cent is required to halt the spread of virulent diseases like measles. VaxOnTime is available in the Apple Store, Google Play and Windows. You can get more details at Better Health, the Victorian Government&apos;s online health channel. Have you ever forgotten your child&apos;s vaccination?